First of all a Happy New Year to all readers! We have now come over the middle point of the Letters-of-Intent (LOIs) process to produce a detailed baseline design (DBD) of the ILC detectors. The first half was very productive. Starting from the call for LOIs and establishing the advisory scheme, the International Detector Advisory Group (IDAG), we came through the validation, which included both hard work for preparation by many people and elaborated examination by IDAG. Much work on detector R&D and physics simulation is now being continued to be integrated into two detector systems by the two validated groups. While further efforts are needed towards the completion of DBD, it is timely to make an interim report now, and we are already working on it. Not only it was required by International Linear Collider Steering Committee to report the progress, it will be useful for us to summarise how much we have done and to make it public. It will also clarify the amount of work lying in front of us. The contents of the report have been drafted by many members of the detector community and are being edited by the management. After the final polishing by the communicators, it will be published in a similar format as the Gobal Design Effort’s interim report. 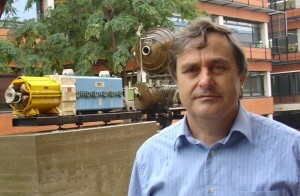 Juan Fuster in front of exhibited LEP components in Valencia. He is the new European regional contact for the worldwide study, taking over from Francois Richard. Close to the end of the last year, we were informed that European Committee for Future Accelerators (ECFA) nominated Juan Fuster of IFIC as the new European co-chair of the worldwide study (WWS) organising committee (OC) to succeed François Richard (from CNRS/IN2P3 at LAL in Orsay, France). François organised many ECFA Linear Collider workshops, of which the most recent one in Geneva and at CERN last October was organised jointly with CLIC. Juan will begin the role by hosting the coming LCWS11 in Granada, Spain, in September this year. It is our practice to ask the WWS-OC co-chairs to serve as the regional contacts of the detector management. Our European regional contact also will change accordingly this month. A big thank you to François Richard! Taking this opportunity, I wish to thank François for his contribution since the very early phase of the present Letter of Intent process. He played a big role in planning the scheme itself. His long experience in the ILC detector activity and enthusiasm for electron-positron physics constantly meant a powerful driving force as we came along. It was a pleasure to work with François. His frank opinions were valuable and often gave power to our activity. His contribution was not only in the managerial field but in actual physics consideration, as was shown when we studied the Strawman Baseline 2009 Report (SB2009) performance. We strongly hope and believe François will remain in the field and strive with us. At the same time we are very pleased that Juan Fuster of the Instituto de Física Corpuscular de Valencia IFIC in Valencia, Spain takes over the important task and joins us. He has a long carrier in electron-positron physics research which goes back to the CELLO experiment at PETRA at DESY in the 1980s and then to the DELPHI experiment at LEP when he was at CERN. In those experiments he accumulated an allround experience in detector R&D and construction, in developing and running a trigger system and in physics analyses of new particle searches or quantum chromodynamics (QCD) studies, namely jets of gluons and heavy flavours. He convened the QCD studies of LEP-I analyses. When Juan went back to Spain, he started in Valencia a team which developed the first silicon detector in the country, participated in the ATLAS experiment at the LHC and produced one-seventh of its forward silicon tracker. While working on heavy-flavour physics with his students, he keeps an interest for electron-positron physics, which was lucky for us. He made a leading effort to make a Spanish group to join the ILC activity. Juan also has managing experience as the director of his home institute IFIC. We are glad to have Juan’s fresh power and look very much forward to working with him. For smooth transition he has been joining many of our meetings since December.